This show just keeps delivering strong episodes. I expected going in that we were going to dive headfirst into the Shoko situation. 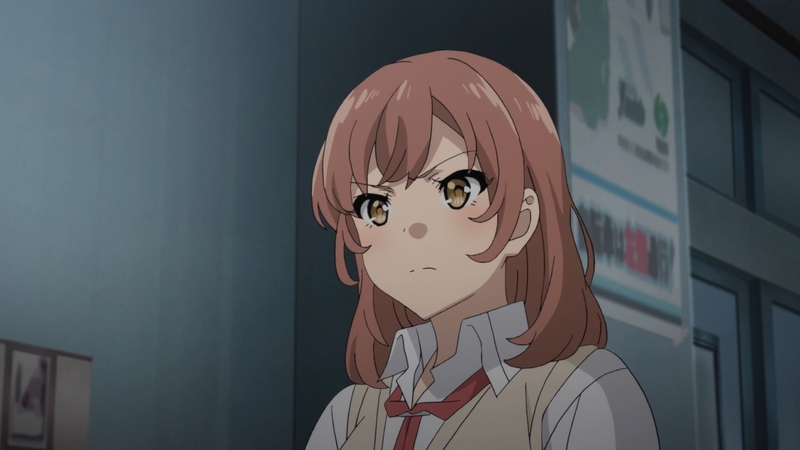 While this Shoko did get some scenes, this episode was not about her. I’m not sure if the plan is to handle her situation in tandem with the actual main arc or if she’ll be hanging around until the last arc of the series. But regardless the focus is squarely on Futaba….and Futaba. You knew they were building up to a crisis with her. What I didn’t remotely predict was that she was essentially going to duplicate herself. We’ve seen some crazy stuff in this show from people disappearing to time loops/simulations. But this is pretty crazy for a development. I’m not entirely sure how Sakuta is going to figure this one out, but it will be interesting to see what happens. I kind of like how they do keep it uncertain who if anyone is the real Futaba. The instinctive reaction is that the one at Sakuta’s place is the real one. 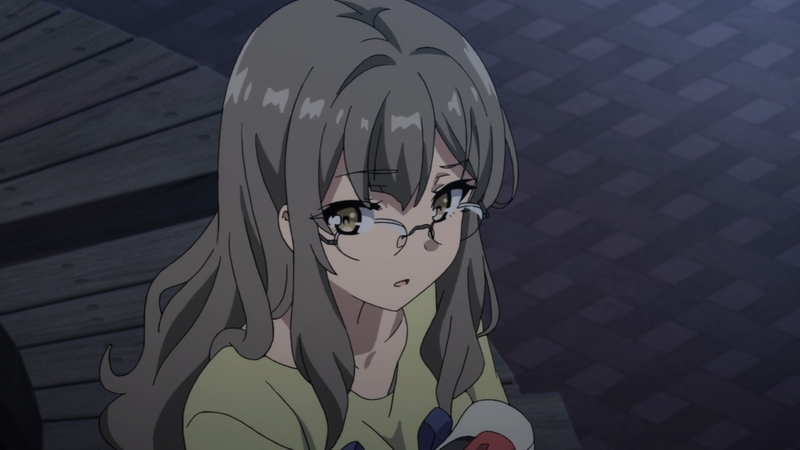 She looks like the Futaba we’re familiar with and you immediately sympathize with her with losing her place at home. But for all we know she is the fake. She isn’t willing to go home because maybe she is afraid she isn’t the real Futaba. That could be an element to this. But we just don’t know. What seems obvious is how they represent an internal crisis for Futaba. You have the status quo Futaba who looks like the girl we’ve known all this time. Although you could say she’s not quite as confident as usual and is holding things back. Then you have the Futaba with a different hairstyle and possibly taking risqué photos of herself. Is one real and one fake? Or is it more like they split from the same source? Futaba 2 (with the new hair) could just be a part of herself that wants to take more action to get Kunimi. Or maybe a part of Futaba that just wants to be more like the kind of girl she thinks he’s interested in. This one is spending time around school in part so she can see Kunimi more. The other Futaba is basically hiding. We haven’t seen any clear effort on her part to go and see Kunimi. In fact Futaba 2 is saying that Futaba 1 knows why they are in this situation and is lying about it. Something must have happened. That’s just a given. And I’d be willing to bet that something involves Kunimi or maybe his girlfriend. If she’s been harassing Sakuta then it’s possible she approached Futaba. I do think the solution to all this will in part come down to Kunimi getting involved. And I honestly like the guy. He realizes quickly enough that something is up. He’s not the type to just force himself into the situation though. If Sakuta or Futaba is willing to reach out though then he’ll be ready to race over to help in whatever way he can. The one-sided feelings that Futaba has must be part of what caused this and I can’t see it being resolved with Kunimi staying out of the picture. And hey maybe this arc will finally give his girlfriend a fragment of likability. If she was total scum wouldn’t she just spread around the pictures she found and point out that it is Futaba to everyone? I suppose there’s a selfish angle that she doesn’t want a friend of her boyfriend doing something crazy that could hurt his reputation. But I’d like to think she isn’t totally worthless and has qualities that did make Kunimi fall in love with her. I really liked the quick little banter with Koga and Sakuta in this one. It’s nice to see them back to their status quo. He’ll tease her a bit and she’ll react in an adorably over the top way. 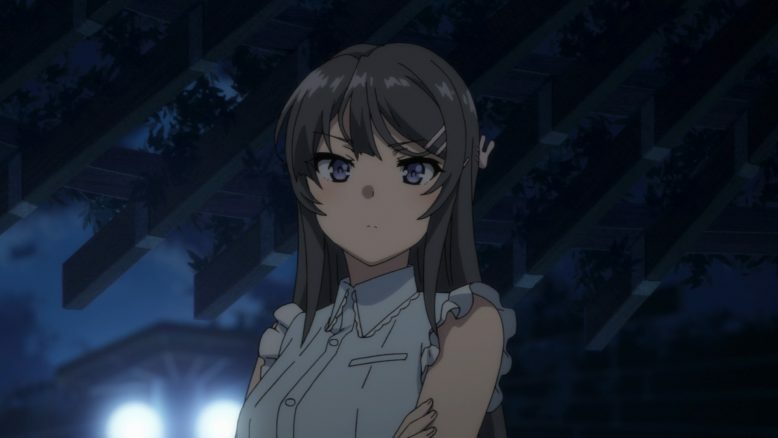 But in a sense what I like is how it shows why Sakuta and Mai are perfect for each other. No one has the total advantage in that relationship. 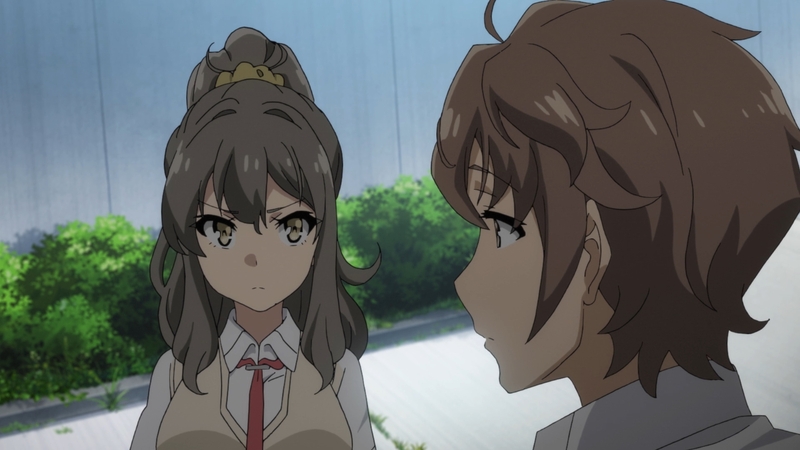 There are times when Sakuta can totally put pressure on Mai. He gave her some guilt with making a point of how they hadn’t seen each other much lately because she’s been working too much. 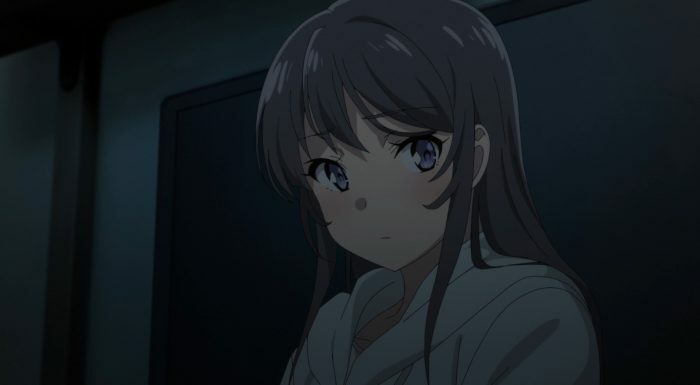 But then you have Mai easily able to turn the tables in a different conversation when she’s spending the night at his place. They both are capable and can hold their own. 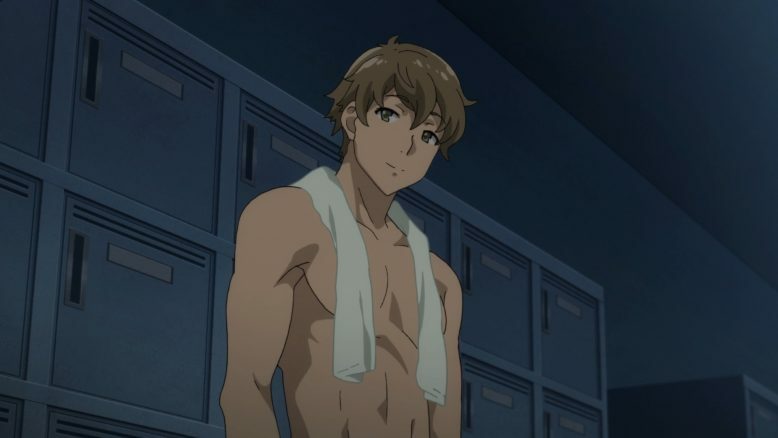 Sakuta has a good poker face, but he does sometimes let his guard down. That you can see genuine surprise or excitement from him just makes the whole thing feel more real between them. I just hope that phone call with her manager isn’t leading to trouble. I’d like to avoid the classic issue of her being famous and their relationship becoming public possibly causing trouble. I can’t see Mai being pressured in that sense though. She changed agencies once because of that photo shoot her mother put her through. If someone tries to say she can’t date someone then she’ll properly brush them off too. Maybe some pressure could come from the possible impact media attention on that relationship could have on Kaede. The sound of a mobile phone scares that girl. There was almost no time for much focus on Shoko. I still don’t know if she’s aging backwards through time or something random like that. There’s clearly some home issue preventing her from asking her parents about adopting the cat. But I don’t know what to make of her issue yet. I’m not even sure if that will be a focus with the current situation around Futaba taking priority. In that respect I’m curious to see what will happen. If Futaba 2 is seriously acting out then that does put some pressure to resolve this situation fast. And really this situation can’t continue forever. I’m just curious about when these two are going to sit down and talk. Both seem interested in avoiding directly interacting, but I can’t see this resolving with them never standing in the same room. Should be interesting to see what happens.